On the morning of September 20, local time, shortly after an Indian Jet flight with 166 passengers took off from Mumbai, a number of passengers suffered discomfort, 30 of whom developed ear and nose bleeding. 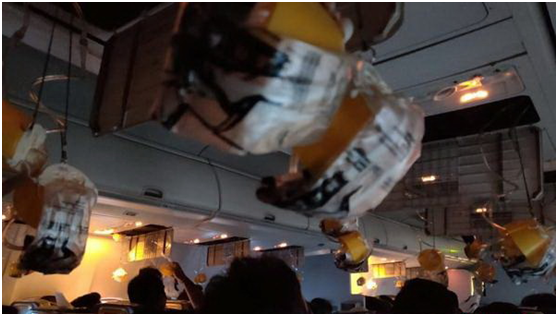 The picture shows the oxygen masks falling down for passenger’s use in the passenger aircraft cabin. Reported that shortly after the plane took off, some passengers began to complain of physical discomfort, followed by some passengers appeared to have symptoms of bleeding from ears and nose and some passengers said they had severe headache. Due to the increasing number of discomfort passengers, the aircraft was forced to return. After preliminary investigation, the cause of the accident is a big surprise: It turned out that the crew members did not open the maintenance device of cabin pressure then resulting in abnormal cabin pressure. Lalit Gupta, secretary – general of India Civil Aviation Bureau stated at present, the crew members has been suspended. The picture shows the passengers are off the plane after the flight returns and emergency landing. 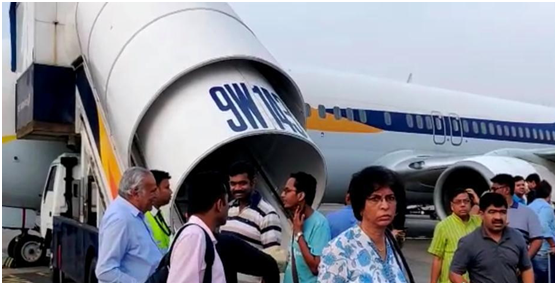 According to the Times of India, the plane involved was a Boeing 737 jet from Jet Airways (India), which was a domestic flight from Mumbai to Jaipur, Rajasthan’s capital with a total of 166 passengers and 5 cockpit crew members were selected, with a flight time of about 2 hours. Passengers posted videos of air masks hanging from the ceiling on social media website and said the crew members had not explained what was happening on Boeing 737. More News to Click Here.